Capcom Interactive‘s new social game, Smurfs’ Village brings our beloved brigade of blue skinned characters to the iPad. From a graphics and execution perspective, the work they’ve done is masterful. 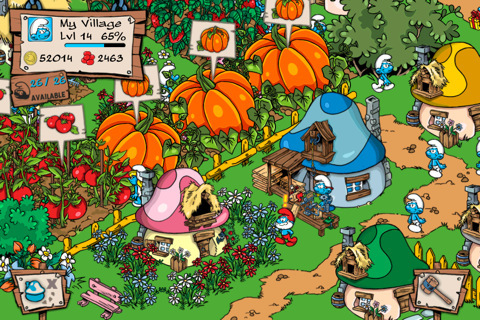 But when it comes to game play, Smurfs’ Village is just another drop in the social game collection. 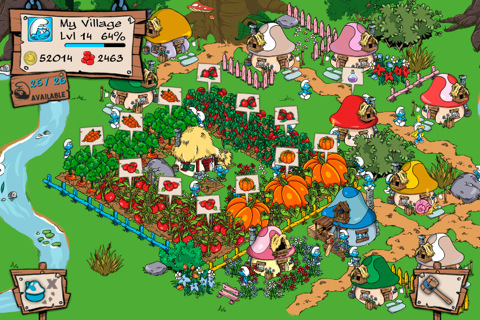 If you’re a self-proclaimed hater of Farmville and other social games that end up all over Facebook, Smurfs’ Village isn’t going to change your perspective, at least not in the long run. When you jump into the game for the first time, you choose whether you want to connect to Plus+ and then start building a safe Smurf Village. 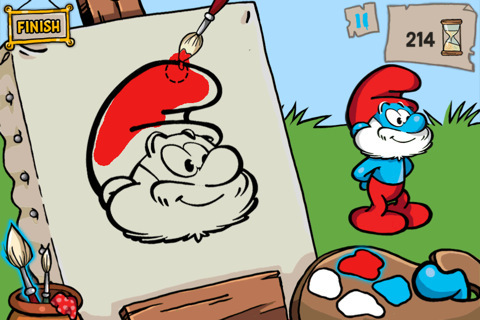 Papa Smurf leads you through all the steps you need to build homes, get a bakery in place, camouflage the town with tall grass, and create a generally functioning society. The music is great, the graphics are stupendous, and everything about this game is generally cute. It’s a good time for a little while, but then it just turns into another social game like most of the rest of them. Like most other social games out there, there’s also a crops component. The Smurfs in the village grow blueberries, raspberries, potatoes and a slough of other crops in the usual wait-until-they’re-ready-to-harvest fashion. You start with just a couple Smurfs in your village and then pump up the volume by increasing your population so there are more people to do more work, installing power up houses like Hefty (which ups your productivity), and much more. You can also purchase things along the way with coins, which is a decent but fairly normal addition. In the midst of the population growth, the game incorporates some decent mini games. You can bake cookies in the bakery or shake to create potions, for example, but all of these experience point building experiences can only be played every now and then. In other words, Smurfs’ Village is another one of those play and wait social games that’s based entirely on experience points. You earn points when you harvest crops, play games and more, and the only way to get past the waiting is to use Smurfberries. At first the game teases you with a few free and earned Smurfberries, but it doesn’t take long to realize that if you want to turn your village into a mecca then you’re going to pay up for that free app you downloaded. Either that, or you’ll spend a lot of your time in waiting. In the beginning it costs just a few Smurfberries to get things done instantly, but it doesn’t take long before you’re spending dozens of berries just to build bridges and reap instantaneous rewards. If you’re interested in spending a little money for your free game, it’ll cost you about $4.99 for 50 Smurfberries, $11.99 for 150, and $59.99 for 1,000. 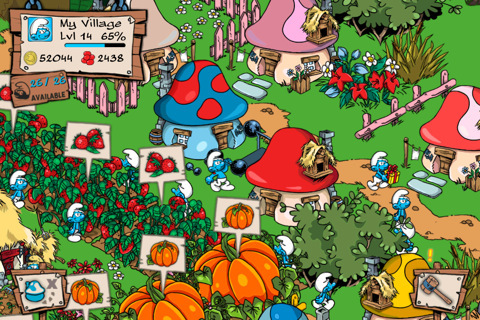 In the end, if you really want to get into Smurfs’ Village you’re going to either need to spend some real cash on Smurfberries or end up checking up on things intermittently and wasting a lot of time waiting. Any way you slice it, the game is decent for a village simulation experience. You can visit neighboring towns, find friends from your social networks, and watch your town thrive with Smurfs. All you have to remember is that the initial Free price tag isn’t entirely truthful if you really want to play. 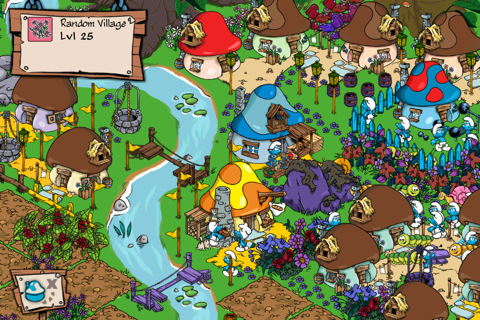 Bottom Line: Smurfs’ Village is an average social game with gorgeous graphics and a cute premise. Perfect for Smurf lovers who enjoy social games, but this title isn’t going to convert anybody who isn’t already on board with the pay for experience points craze.